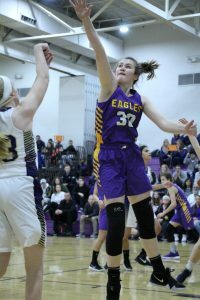 ALLEN PARK, MI (December 14, 2018) – The PCA Girls Basketball team began their conference schedule tonight with a tough match-up against rival, Inter City Baptist. PCA stood toe-to-toe with the Chargers for three quarters, but ICB made their free throws down the stretch to fend off the Eagles, 38-29. From the opening tip, there was intensity from both teams – especially defensively. Inter City used a number of pre sses and traps, while PCA moved from zone to a match-up man-to-man. After one quarter, ICB led 13-9. The game was tied late in the quarter, but Inter City forced two late turnovers to take the lead. PCA missed some shots in the second quarter and that led to transition opportunities for the Chargers A lay in at the buzzer gave ICB a 10-point lead at 21-11. But the Eagles would not quit. With some solid bench minutes from Emma Heussner, Eva Warmbier, Sarah Fernandes and Rachel Costello, PCA outscored Inter City, 13-5 to cut the lead to 26-24. To close out the third quarter, Sarah Fernandes slashed to the hoop and finished with a pretty lay-up. The fourth quarter saw a similar effort, but PCA could not cut into the Chargers lead. They spent needed energy trying to tie the game and with a late flagrant foul call, ICB closed it out at the charity stripe. 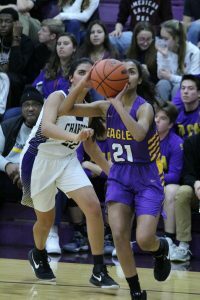 Pacing the Eagles were Anna Fernandez with 10 points, Harlee Collins six, Sarah Fernandes five, Isabel Mossel and Ariela Boboc each had three and Ella Godin had two. Boboc also had three blocks and Collins had five steals. PCA heads to Grosse Pointe to take on University Liggett on Tuesday. Tip time is 5:30.